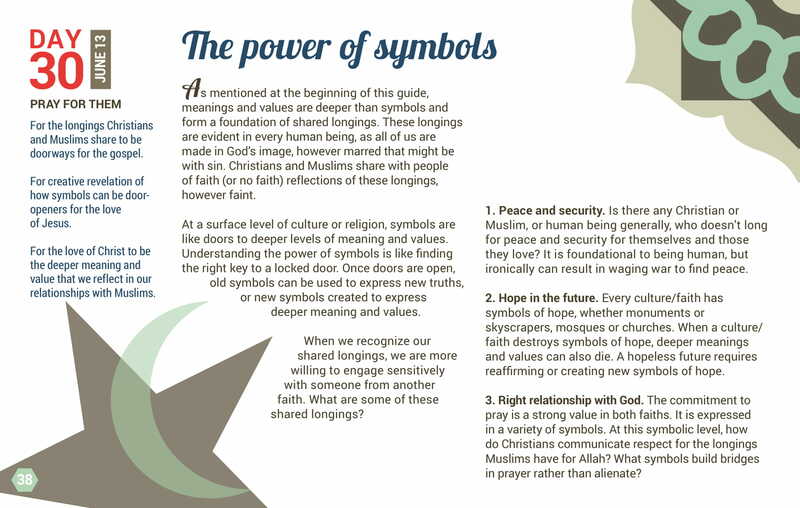 As mentioned at the beginning of this guide, meanings and values are deeper than symbols and form a foundation of shared longings. These longings are evident in every human being, as all of us are made in God’s image, however marred that might be with sin. Christians and Muslims share with people of faith (or no faith) reflections of these longings, however faint. 1. Peace and security. Is there any Christian or Muslim, or human being generally, who doesn’t long for peace and security for themselves and those they love? It is foundational to being human, but ironically can result in waging war to find peace. 2. Hope in the future. 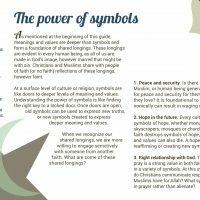 Every culture/faith has symbols of hope, whether monuments or skyscrapers, mosques or churches. When a culture/ faith destroys symbols of hope, deeper meanings and values can also die. A hopeless future requires reaffirming or creating new symbols of hope. 3. Right relationship with God. The commitment to pray is a strong value in both faiths. It is expressed in a variety of symbols. At this symbolic level, how do Christians communicate respect for the longings Muslims have for Allah? What symbols build bridges in prayer rather than alienate? For the longings Christians and Muslims share to be doorways for the gospel. For creative revelation of how symbols can be door openers for the love of Jesus. For the love of Christ to be the deeper meaning and value that we reflect in our relationships with Muslims.